Cleanliness is vital nowhere else more than in a hospital. It should not have to be said, but we at Penn Jersey want you to know how much we understand this. It has been this company’s honor and pride to serve medical institutions across Philadelphia. From hospital window cleaning to the thorough sanitization and polishing of hospital floors, Penn Jersey have staff, sometimes spanning 3 generations, with the knowledge, training, and equipment to carry out the most thorough of cleans. Hospitals often need to be fully operational 24/7 and this is never more so than in the ER. However, there comes a time when a normal clean is not enough. Wherever possible, it is good to have annual or more regular deep cleaning operations throughout the hospital. Penn Jersey understand that it is not realistic to do the whole complex in one go, but have the tools and experience required to undertake a full deep clean on a room, ward, section basis. This will return the said area to peak condition for the better treatment of patients. 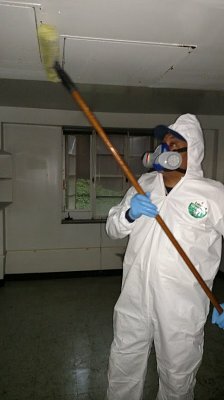 Hospital cleaning is a specialist and unique process which our trained professionals are experienced and well-versed in. We provide hospital cleaning and decontamination services in both reactive circumstances and on an on-going basis, providing teams who work within the same premises every day. We appreciate the high-risk nature of much of hospital cleaning work and ensure our teams are prepared and trained to deal with the environment they are working with. Our teams have the experience and understanding to deal with sharps, offensive waste and general waste, as well as carrying out comprehensive decontamination cleaning where necessary. Poor hygiene in any medical environment allows disease and infection to spread. Hospital superbugs have developed due to unhygienic and unclean medical environments. We work to ensure all potential bugs and bacteria are wiped out before they get the chance to spread and become a health hazard. The potential harm to health of the wider popular should a bug or bacterial infection spread in a hospital is a huge risk. Our experienced cleaning teams recognize this and have the skills, equipment and tools to ensure all cleaning is carried out to the highest standard, ensuring decontamination and disinfection protocols are met and followed. Wherever possible, it is good to have annual or more regular deep cleaning operations throughout the hospital. Penn Jersey understand that it is not realistic to do the whole complex in one go, but have the tools and experience required to undertake a full deep clean on a room, ward, section basis. Our services are delivered with the same high level of care, attention and urgency, whether on a day to day basis or dealing with a one-off event. The high footfall and infection risk in any hospital environment makes cleaning an absolutely vital maintenance service, and our cleaners proudly and efficiently deliver the highest quality in all that they do. We can arrange schedules with you to suit your environment, delivering regular cleaning at times which are least likely to interfere with and cause disruption to the daily running of the hospital. Our team are simply waiting to get involved and help ensure the highest levels of cleanliness are always provided.